When last we left our heroes, we were being relentlessly pursued by an angry flesh golem (and really, is there any other kind? ), which was currently tearing apart the secret door we’d closed behind us. We decide that the equivalent of a short rest has passed. We shoot a few arrows at it, and it withdraws . . . only to bash through the door using another door as a battering ram. Curses . . . animated mound of flesh is a SMART animated round of flesh. We toss a torch on a quickly-erected pile of wood, and the thing again withdraws screaming. We also withdraw, so as not to choke to death in the smoke. Dragon Killer on the loose? Investigate connection between the death of Smarlgon and the death of Garatalz. Samrlgon is one of Pan Caulderax’s lieutenants in the Majestic Fastness and was killed several weeks ago in a fight with a adventuring party. Garatalz was one of Duke Divolic’s Blue Dragons and was killed in the failed uprising in City-State. Could not care what happens to a Blue Dragon except two dragons in a matter of months are killed. Goods smuggled to and from Warwick via a secret port on the River Severn over the Troll Mountains. 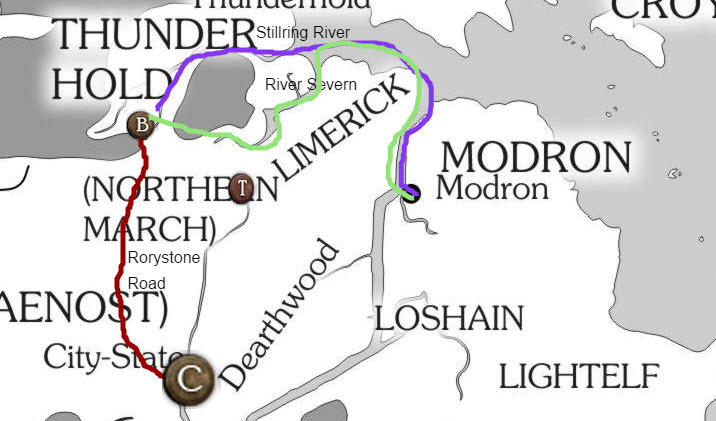 Goods are then taken overland to contacts on the River Stillring and sent to Byrny via smugglers on boats. The Dwarves have a blind spot when it comes to river bourne traffic and rely mostly on their human subject which are easily bribed. Rocknut tribe of Trolls causing issues. May have to use the allied tribe of the Splatterskulls to eliminate them or to subjugate them. The Silverlode Mining Company of Adventures are a direct route of smuggling goods from the Majestic Fastness and into Byrny. Ardan Morcor is the leader a noted fighter. Only one reliable contact in Thunderhold. Rigsmal the Innkeeper of the Jewel Thief’s Pub. 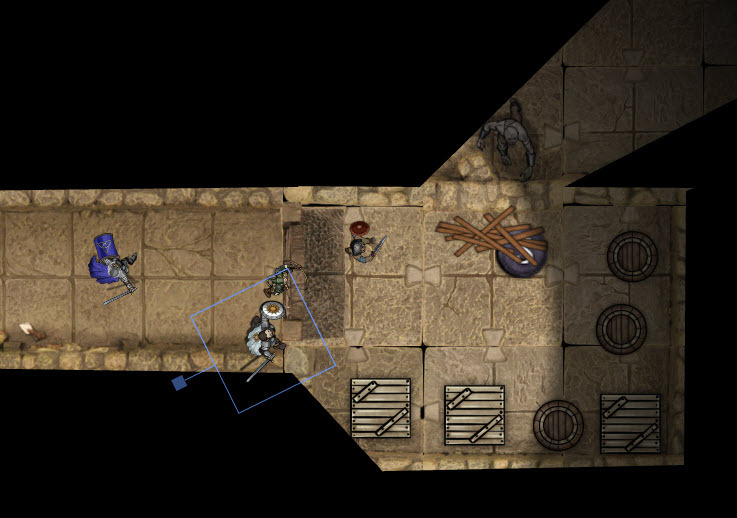 The Dwarven vigilance make it difficult for him to do anything beyond offering temporary lodging to passerbys. Primary task is too facilitate shipment and smuggling operation to and from the City-State along the Rorystone Road. Most recent job is to send a messeger to Master Ordal, a master merchant, to help to rescue a daughter of a City-State Knight, Sir Marius of Clan Alarain. The Knight in the pay of Pan Caulderax. Another order is to Keep Maud safe as leverage over the Dragon Mori. We will need her service in order to escalate the situation with the warring factions of City-State. Hmm. Some good leads here. Maud, on the other hand, wants to know if we’re taking her back to Mori, the green dragon. 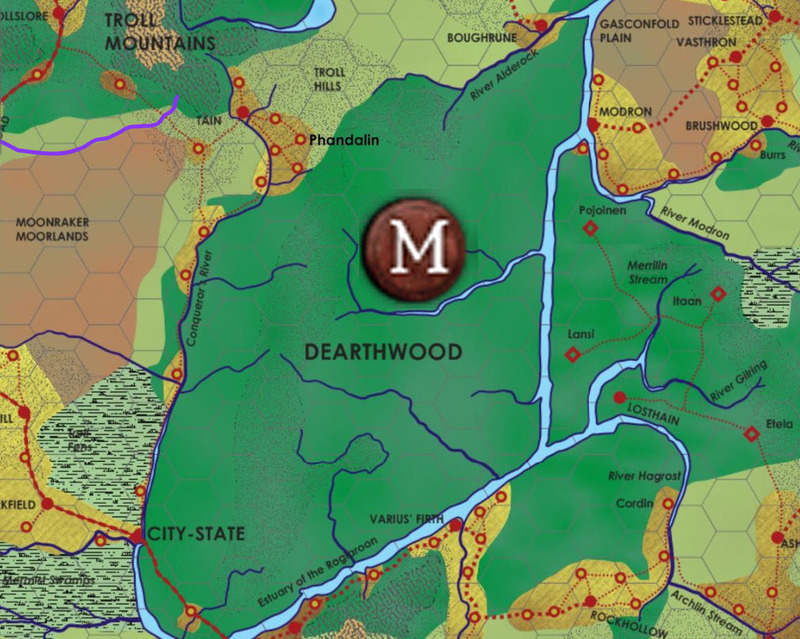 We know he lives in Dearthwood, but we have only a vague location. And we also have to raise Colin McDaw, the PC that croaked it last time due to a bad roll on a death check. Turning him from a meat popsicle back to a real boy will run us only 1,000silver. The god Set created the dragons as elite shock forces against the Demons during the Uttermost War. After the war the Demons were imprisoned in the Abyss. A ward was placed around the entrance to bar them from returning to the Wilderlands. The ward was comprised of crystals placed in several towers around the entranceway. The Dragons were charged to act as guardians and to protect them against any outsiders. After a thousand years some Dragons began to become bored of this duty and yearned for the freedom of the Wilderlands. When the Black Lord arrived seeking aid in the Crystal Wars those dragons eagerly agreed to join him. For betraying their duty these dragon became known as the Black Dragons. After arriving in the Wilderlands some of the Black Dragons chafed at aiding the Black Lord. They instead left to make their own way. These Dragons became known as the Copper Dragons. The remaining dragons resolved that the Black Dragons betrayal shall not go unpunished. They sent out a small contingent of loyal Dragons to aid the Black Lord’s foes and to bring the Black Dragon to justice. They adopted silver as their color. When the Crystal Wars ended with the destruction of the Black Lord, the Black Dragons scattered. Some of the loyal Dragons were changed by the war. They became obsessed, believing that any means was acceptable in hunting down the Black Dragons. These Dragons changed their color to Blue. The dragons that remained behind to guard the towers adopted Gold as their color and still await the return of their brethren. Dragons are reptilian with four limbs, tails, and wings folded into their front limbs. Their hide is made of scales and is one of the toughest substances known in the Wilderlands. A Dragon sense of time/sense is very different than that of the races. They know how they end as well as their past. They perceive time as one moment. This ability doesn’t extend to the mortal races, including Elves, only to themselves. It is for this reason that Dragons will actively involve mortals in their plans. It is only through mortal action that a Dragon’s fate can be altered. A Dragon is extremely confident of himself and his position in the world. They believe that they are the highest creatures of creation and view other races as children or with contempt. A few dragons, notably the Silver Dragons, have come to understand the ability of mortal races to alter their fate and actively involve themselves with mortals. We ask Maud if she knows Mori’s son, the green dragon in Thundertree – he’s been a bad boy and should come home to his mommy. Maud says he gives her the creeps; Mori told her that if anything would ever to happen to Maud, she should not go there. We’re all very much getting the feel that Maud is actually Mori’s biological daughter via shapeshifting . . . and we also have the token of Pan Caulderax. When we interrogated Pardan we also knew that Mori had ordered her son to return home. We contribute back into the community pot as well, zilching out some of us (Marcus and Keyar zeroed out their personal funds, for example), and leaving 3,857s for the community pot. Socialism in action, to each according to their need, etc. That was a pretty effective shopping trip. The monsters will probably level up too. We go catch a boat. The Sheriff introduces us to Captain Vargan Larador, who will take us to Modron. He asks if we’re expecting trouble – I tell him that based on my current run of luck, we should expect to be harassed by monsters, assaulted by pirates, and probably a random storm or two. It takes us two days to reach Modron, and we are not assaulted in any way, but it is a heavy rain as we arrive. 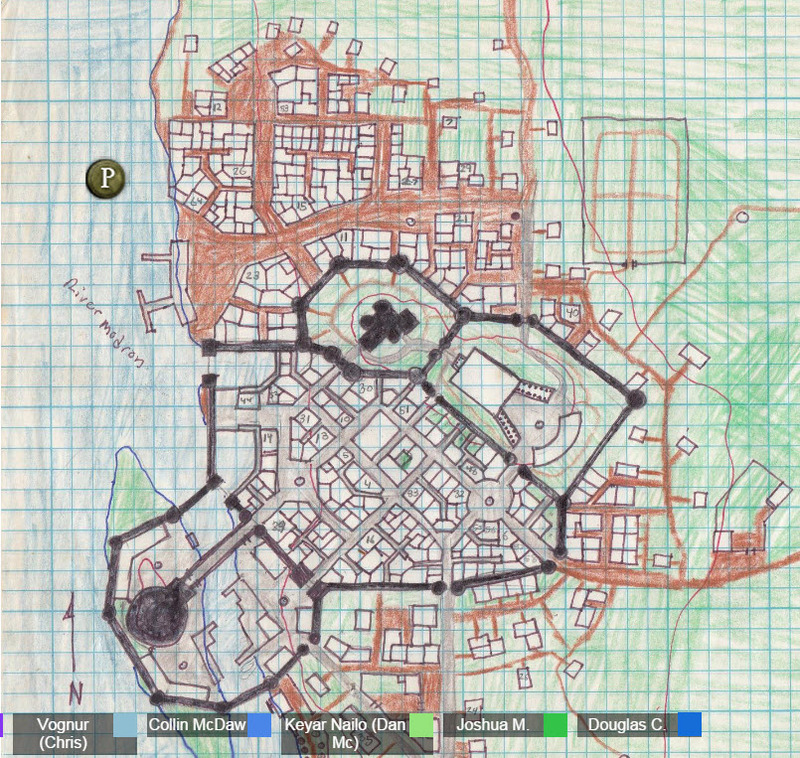 Modron is a major walled city. We should have done our shopping here for the big magical stuff. Alas. We know where the main temple of Mitra is, in the center of the map, and the palace of the Prince is next door. We decide not to pay our respects to the prince, because that doesn’t end well. “Ummm . .. leaf, I think. I’d love to reserve a room.” It’ll be 50sp, and that will cover everyone. Nice. Good thing we kept some money in the party pool. Over at the temple, Carmina is greeted as the elder she is by Bishop Dentus. Introductions are made. We report that things are not going well in City-State. As far as we can tell, the rebellion was short-lived, premature, and messy. It may have even been instigated by forces seeking chaos in the city, instigated by Pan Calderax. She did complete her mission to turn over funds from Tain, once we’d liberated Tain. We wound up, um, killing the Sheriff, burning the keep, and rescuing the Bishop. Yeah . . . we try and explain, but it doesn’t go well (nor should it, as it was not our best day). We do note that the Settites had been driven out, the adventuring party was left in temporal power, and the church was restored to power. But many other bad things – Highgarden and Norcross – were stirring, and calmness and order weren’t in the cards. That’s our story and we’re stickin’ to it, etc. The sitrep for the Prince of Modron is to urge calm. An expeditionary force will try and retake Tain from the towns to the Northwest – perhaps the Prince could give reasons to not expand the civil war to the lords of City-State. We also note to the Bishop that we’re trying to split off a faction of black dragons from Pan Calderax, so that might help guide the Prince to tell them that they’re being used as pawns to Pan Calderax. The Bishop “officially” partners Carmina with Marcus to stop Pan Calderax. We do a pretty massive paper dump – a scribe is summoned to copy the documents. Quarterly reports are requested. Carmina requests a letter of introduction from the Modron’s office instructing the Faithful to give what aid they can. They give us a voucher for 7 days stay at the Lamb and Spirit, and they bequeath the 2,000sp that Carmina has in her possession to her as an expense account. Back at the Inn, they play music (collecting 180sp in the process! ), and collect rumors. The Viking king of Ossary fell – the kingdom is split between the forces of Prince Artos of Nomar and Duvalic. Details on the rumors to follow, and we end it there. So, again, no combat this game except in the beginning, but a lot of roleplaying and we are tracing down what feels like key leads. We collect 600xp, including “defeating” the Flesh Golem by sealing it into the basement with no other exits. Nice write up–glad I was there this week.